Land of Odds (http://www.landofodds.com/store/alldolledup.htm) announces its fifth 2013 All Dolled Up: Beaded Art Doll Competition. Entries accepted between September 1, 2012 and August 31st, 2013. Create a Beaded Art Doll by manipulating beads and forms into an imaginative tactile and visual 3-dimensional representation of this year’s theme: TRANSFORMATIONS. The 2013 ALL DOLLED UP: BEADED ART DOLL COMPETITION is offering a first prize of a $1000.00 shopping spree on the Land of Odds web-site (http://www.landofodds.com), and a Runner-Up prize of a $400.00 shopping spree on the web-site. Entries will be judged by a panel from The Center for Beadwork & Jewelry Arts. A Beaded Art Doll is a physical representation in three dimensions, using human figural and expressive characteristics, through the creative use and manipulation of beads. Beaded Art Dolls submitted as entries for this competition should be immediately recognizable as a “Doll” as defined above. Beaded Art Dolls should be between 8” and 36” in size. They must be at least 80% composed of beads. The doll’s internal form and structure may result from many techniques, materials and strategies. The bead stitches themselves might be used to create the skeletal structure. Various forms of cloth dolls might be stitched or embellished with beads. The underlying structure might be made of polymer clay, wood, ceramic, porcelain, Styrofoam, wire, corn husk, basket weaving, yarns, cardboard, paper, cotton, or some combination of materials. It might be a found form or object. The Artist is given wide leeway in techniques for how the doll is to be beaded, and may use one particular technique or several. Techniques, for example, may include bead weaving stitches, bead embellishment, bead appliqué, bead knitting, bead crochet, bead embroidery, lampworking. These should NOT include the application of rhinestones, sequins, nailheads or studs. The beads may be of any size, shape, color and material. The Artist may interpret and apply the theme “Transformations” any way she or he chooses. The Beaded Art Doll might be thought of as a plaything; or a visual representation of a person, feeling, spirit or thing; or a tool for teaching; or a method for stimulating emotional development or healing. As an object of art, the goal of the Doll should be to make a statement, evoking an emotional, cultural or social response, either by the Artist her/himself or by others. The Doll must be an original work, and may be the work of one Artist or a Collaboration. ALL DOLLED UP: BEADED ART DOLL COMPETITION is more than a beauty pageant. It is a design competition. The Competition will take into account the Artist’s intentions and how well these are incorporated into the design. Land of Odds, home of the annual ALL DOLLED UP: BEADED ART DOLL COMPETITION. Visit www.landofodds.com/store/alldolledup.htm to review the Official Rules. Land of Odds provides doll, bead and jewelry making artists with virtually all their beads, supplies, books and jewelry findings needs, with over 30,000 products. Retail/Discounts/Wholesale. 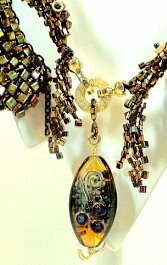 This entry was posted on August 9, 2012 at 3:50 am	and is filed under beadwork, Contests. Tagged: beaded art doll, cloth doll, fiber arts, figurative sculpture, mixed media. You can follow any responses to this entry through the RSS 2.0 feed. You can leave a response, or trackback from your own site.